Read famous French fairy tales in a vast collection of French folklore from authors Charles Perrault, Sophie Segur, and La Fontaine to name a few. 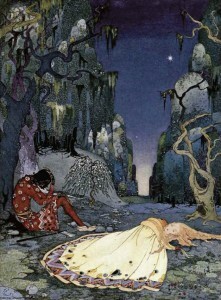 Jump to full list of French fairy tales. About: Several beloved fairy tale and folklore authors originated in France, and gave the world characters we still love today. Sleeping Beauty and Puss in Boots, among others, leap from the pages into the public consciousness. French fairy tales and folk tales were some of the first oral stories to be collected and written down, and indeed, would go on to inspire other notable storytellers, such as the Brothers Grimm. Charles Perrault, a writer of fairy tales and folklore, was known to have collected nearly all of his tales from folk storytellers, then rewrite them for the upper-class, who were hungry for stories. Like those he inspired, he would use the tales as moral stories for the young and old. “Violette consented to willingly sleep in the forest. Illustration by Virginia Frances Sterrett from Old French Fairy Tales, published 1910. Fairy tales and folk tales were extremely popular with French women, who would gather in salons to share their own fairy tale writings and other topics, especially those considered inappropriate to discuss in the presence of a man. Among these women was the Countness D’Aulnoy, also known as Marie-Catherine D’Aulnoy, whose tales were in a more conversational tone. She is noted for popularizing the word “fairy tale,” as her works were described as “Conte de Fées,” which literally means “tales of fairies.” Sophie Segur, another female author, was of Russian birth but wrote primarily for a French audience. 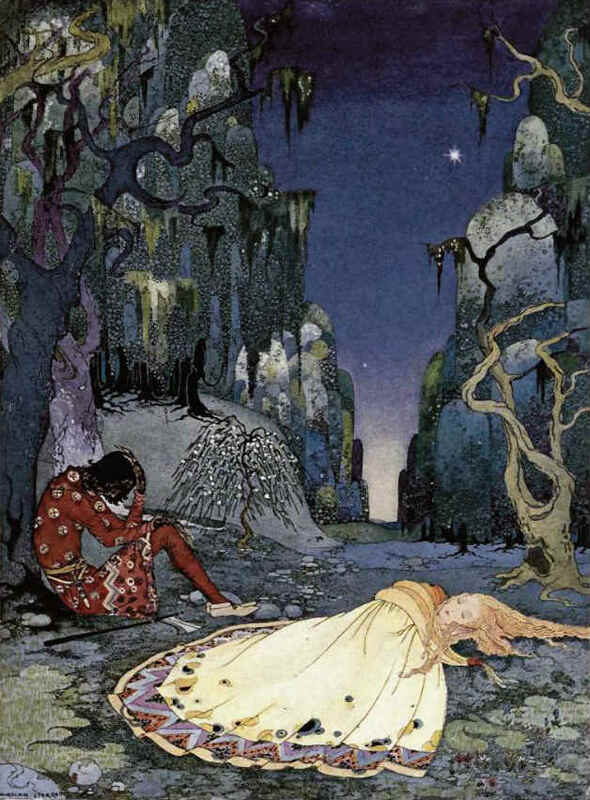 Unlike other folk tale types, French literary fairy tales were viewed as art by the upper class, and were popular in Louis XIV’s court, who encouraged Charles Perrault to write these tales extensively. The King wanted the world to see the intellectual culture of the people of France. The stories have characteristics such as the inclusion of fairies (hence the name given to the genre), as well as plenty of magic, dark and mystical elements. Heroes would encounter the dead and might be transformed into an animal or witness the transformation of another. Women were locked in towers to await their rescue, and sometimes, the villain would win. The themes of the stories are overwhelming “marvelous,” with magical objects, places, and figures, and even the mere act of traveling can be made marvelous. French folklore and fairy tales also embraced the fable, and the work of La Fontaine. French fables bear a lyrical style, and depict animals with characteristics similar to humans, such as vanity, slyness, and cleverness. His work was so popular, the fables were often memorized by schoolchildren and recited.